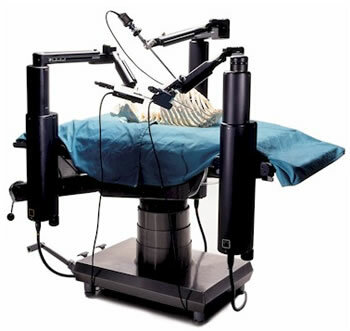 The Zeus robotic surgical system will be used to perform a gall bladder removal on a special training dummy. The following circumstances are unusual: the experiment is being carried out sixty feel under the sea in the Aquarius Lab off Key Largo, Florida. And the experiment is being performed by NASA; if this experiment is successful, astronauts will eventually be able to recieve emergency care while serving on board the International Space Station. The Zeus system shown above is controlled by a surgeon sitting at a remote console. In the NEEMO 7 experiment, the "patient" is off Key Largo and the surgeon is in Canada, 1300 miles away. NASA officials would like to have a safe alternative to bringing an astronaut back down from the space station - at a cost of 500 million dollars. The system actually has a number of advantages right here on Earth; fatigue is reduced because the surgeon does not need to constantly hold instruments and ordinary muscle tremors are filtered out. Read more about NEEMO 7 at Scrubbing up for robotic surgery in space. You might also like How Robotic Surgery Will Work.